Can I delve a Soulflayer to cast another souflayer? 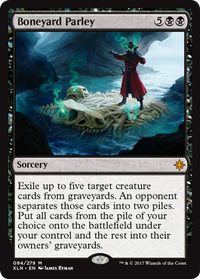 Does Cairn Wanderer retain its abilities in the graveyard? Does Soulflayer care whether delved creatures remain in exile? If a creature card with flying was exiled with Soulflayer's delve ability, Soulflayer has flying. The same is true for first strike, double strike, deathtouch, haste, hexproof, indestructible, lifelink, reach, trample, and vigilance. Darth_Savage on You just got Noped! I fully understand the desire to do something a little different, I started with a very of-the-shelf Hollow One deck, I've been playing on and off for 20 years so I already had Faithless Looting , Burning Inquiry and Goblin Lore , sitting in a box. Fast forward to now, the deck I'm playing is very different to the stock Hollow One, it has Adorned Pouncer and Soulflayer in it for starters. Here's the thing though, it's still essentially a red aggro deck, the core enablers are still all present, just my payoffs are different. Why the tale above? You have marked this deck as a control deck and literally called it You just got Noped! which is evocative of Counterspell . This led me down the path of providing control based suggestions, but that isn't really what your looking for. Stall, bounce and counter is what control decks generally do, I'm not against thinking outside the box, but by definition when looking at someone else's deck list, without a description detailing their goals, suggestions tend to be made based on known factors. I hope my opening comment has introduced you to at least a couple of cards you weren't aware of or hadn't considered, good luck with your brew. I'm hoping to find a way to put Soulflayer in this deck. I'm only worried about the fact that it might be hard to get creatures into the graveyard. If anyone has suggestions? Majestic Myriarch, isn't a new idea Cairn Wanderer , Soulflayer and Odric, Lunarch Marshal , but since none of your creatures have trample (sure they could Chariot of Victory but it costs 3 to cast and you only have 2) it can still be chump blocked by Lingering Souls in most cases.You could run Skinshifter , to provide trample or flying, alternatively use a cheap trampler like Charging Badger . Hope this helps, good luck brewing your deck. Molding your deck around your opponent is a poor plan in general and certainly not something to fixate on. I have a borderline ridiculous casual deck The best cost is free which relies on me exiling cards from my hand to do things. Or how about a deck that is mostly 0 cost artifacts Cheap & Cherio, this only has 15 land, yet it can win. Modern is a format with over 12,000 unique cards and I have no idea how many ways to win, you can't plan for everything. Vampire Nighthawk aggressive creature, kill spell. Bow of Nylea toolbox, passive gain. Guttersnipe burn with a body. Ghostway blink, re-trigger enters the battlefield. This is a bit odd, back in 2017 some of the initial builds of Hollow One tried to use Death's Shadow and Vengevine, those decks did ok, but in the end Shadow was dropped since Flameblade Adept is a better 1 drop in the deck... You have ended up with a Death's Shadow list without Thoughtseize and a Hollow One list with 4 non-red producing mana sources. The draw discard spells are all red, so you need red sources in your opening hand, or the deck stalls... Then there is Tormenting Voice rather than Cathartic Reunion? I'd suggest Watery Grave should be Steam Vents, or Lightning Bolt should be Thoughtseize, so you have the chance of a turn one play without a red source. 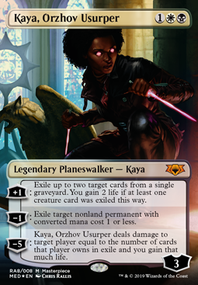 I play a mardu mashup of Hollow One which also runs Soulflayer, so I'm not against the idea (shameless plug Power 4 is Ferocious) but I do think you need to reconsider some of your card choices... Hope this helps and good luck with your brew. I like this deck, and to upgrade it I think (As you may commented above) that you may cu the Risk Factors to add 2 Lingering Souls because it can be a headache to Jund, Sultai midrange or other decks with few creatures or creatures without flying. 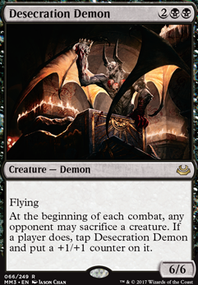 In addition, I think that you may cut 1 Dreadbore to add another Collective Brutality because it's good against burn with his discard ability; his -2/-2 ability is great aginst zoo, humans or spirits; his "2 life ability" can be aggresive; and it is great to feed the graveyard for the Soulflayer. Also, I think that in the sideboard you may cut the 2 Fragmentize to add 2 Stony Silence. Darth_Savage on Advertise your MODERN deck! Primarily this is a Hollow One deck, but using Soulflayer as a backup plan, with the option (just...) to eternalize Adorned Pouncer. 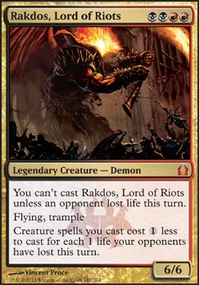 Transformative sideboard to play more of a burn angle when grave hate comes in. No data for this card yet.